Faced with the horrific aftermath of the two atomic bombs dropped on Hiroshima and Nagasaki on 6 and 9 August 1945 respectively, and the losing battles with Allied forces on numerous warfronts across the Pacific, Japanese Emperor Hirohito made the decision to surrender at an imperial conference in the evening of 9 August. On 15 August, Hirohito broadcasted his acceptance of the Allied Potsdam Declaration, and sent out the Imperial Surrender Rescript to the military forces across the Japanese empire. Prince Kan’in Haruhito flew into Syonan (Singapore) on 20 August to personally convey to the 7th Area Army the Emperor’ decision to surrender. Thereafter, General Itagaki Seishiro, Commander-in-Chief of the 7th Area Army, began to withdraw his troops from the city to camps in Jurong, removed them from public sight to avoid provocation, and awaited the surrender and handover to the returning British forces. However, the British forces had to delay their reoccupation of the Singapore colony because of Supreme Commander for the Allied Powers General Douglas MacArthur’s order that repossession would only take place after the signing of the formal supreme surrender ceremony in Tokyo on 2 September. On 4 September, British cruisers HMS Sussex and Cleopatra finally entered Singapore waters, after minesweepers had cleared a path through the heavily mined Straits of Malacca. General Itagaki led a delegation aboard HMS Sussex which was anchored off the Keppel Harbour to discuss the surrender proceedings. Representing Vice Admiral Lord Louis Mountbatten (Supreme Allied Commander Southeast Asia) to sign the surrender agreeement were Lt Gen Sir Philip Christison and Rear Admiral Cedric Holland. General Itagaki was representing Field Marshal Count Terauchi, Supreme Japanese Commander Southern Region. This relatively small scale affair was the actual and effective surrender of the Japanese forces in Singapore, but there was to be a much grander “official” surrender happening on 12 September in front of the Municipal Building under much fanfare and Allied media coverage. The Allied media personnel, among them military film journalists and news correspondents, had landed on Singapore territory with the bulk of the British reoccupation forces from the 5th Indian Division on 5 September. They had initially found the streets deserted and devoid of activity besides the sporadic Japanese soldiers on sentry duties to maintain public order. 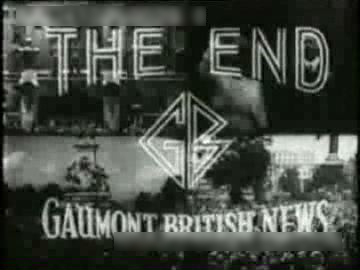 From a Gaumont British Newsreel titled “Return to Singapore: Japanese Surrender is signed and cheers greet the liberators”. Film-stills from the Gaumont British Newsreel “Return to Singapore”. Deserted streets in the vicinity of the Victorial Memorial Hall and the Supreme Court. Japanese troops on sentry at various locations in the city to maintain public order and prevent looting before the arrival of British reoccupation forces. Nonetheless, the crowds in the streets were in the mood to celebrate after more than three years of misery under Japanese rule. And British newsreels filmmakers were on hand to document their jubilation and exploit the footage for propagandistic purposes. Film-stills from the Discovery Channel documentary “The History of Singapore” (2006). British reoccupation troops parade the streets in downtown Singapore. This film-still shows High Street, with the Fort Canning Hill and the lighthouse in the background. Flags of the Union Jack and Kuomintang are popular paraphernalia. Film-stills from the documentary “Singapore 1942: End of Empire” (2012). The jubilant crowd along North Bridge Road, near the junction with Coleman Street. Adelphi Hotel is in the background on the extreme left. Film-stills from the documentary produced by Ministry of Information and the Arts, Singapore “Riding the Tiger” (2001). Ha! Saluting the returning colonial master! This crowd has probably gathered along Bras Basah Road or North Bridge Road. The building in the background seems to be the former Raffles Institution. On 6 September, approximate 34,000 Allied prisoners-of war and European civilian internees were released from the internment camps scattered all over the island. Newsreels filmmakers were to find the health of the POWs and internees, and the state of the prison camps appalling. They had suffered under the abhorrent neglect of the Japanese military administration. Upon release, most of the internees and POWs were to be evacuated from Singapore to India, Australia and the United Kingdom. Conditions at the Changi Prison, where most Allied prisoners-of-war were interned. The images speak for themselves. Film-stills from the documentary “Apocalypse: The Second World War” (2011). Internees at either the Sime Road camp or Changi Prison. Probably the former as the huts were built differently in Sime Road and Changi Prison (depicted in the earlier set of film-stills). The roofs of the huts in the Sime Road camp had wider overhangs. The interior of the POW huts in the prison compound, probably Changi. Overcrowded and in a state of disrepair. The official surrender of the Japanese in Singapore took place on 12 September 1945 in the Municipal Building (now City Hall) located near the Padang. Romen Bose describes the scenario in his book “The End of the War”(2005): “As dawn broke on 12 September 1945, there was a great sense of excitement in Singapore city. Streams of people began making their way to the Padang on foot, bicycle, rickshaws and wood-burning lorries. British Royal Marines lined the streets as the crowds filled the Padang, which was now level, the trenches having been filled in the day before by hundreds of Japanese surrendered personnel, who had worked double-time to complete the task in a day. “By about 10.00am, the Padang was packed, except for the square space in front of the Municipal Building where the Guard of Honour was drawn up. All vantage points had large groups of spectators. Any roof within sight of the Padang was packed with Chinese, Malay, Indian and Eurasian observers who were determined to see the historic event unfold before them. Vice Admiral Lord Louis Mountbatten, the Supreme Allied Commander Southeast Asia, arrived at the Padang in his vehicle to great fanfare — parade commands, gun salutes, national anthems, aircraft salutes and British bugle calls. Lord Mountbatten arrives at the Municipal Building where the official surrender ceremony will take place. Before the surrender ceremony proper, he inspects the guards-of-honour on parade in the Padang. Upper right: In front of the Municipal Building (now City Hall). Lower left: The Padang. Lower right: The Singapore Cricket Club in the background. Film-stills of Lord Mountbatten inspecting the guards-of-honour, from the documentary “Singapore 1942: End of Empire”(2012). Before Lord Mountbatten had finished his inspection, the Japanese surrender party led by General Itagaki arrived in their vehicles and alighted at High Street. They lined up, one behind the other, and then escorted by men from the British, Indian, Chinese, Australian and American Forces, walked down the road in front of the Municipal Building. They were jeered by the Chinese crowd who shouted “Bagero! “(Japanese for “you fool!”) at them. There was intense animosity towards the surrender delegation of seven Japanese area commanders. 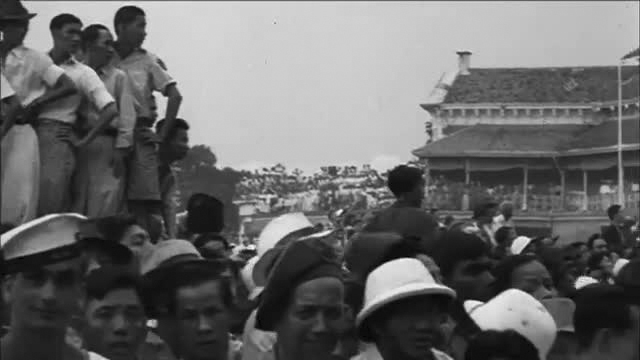 Film-stills from documentaries “Singapore 1942: End of Empire”(2012) and “The History of Singapore”(2006). After the inspection, Lord Mountbatten led a delegation of Commanders-in-Chief of the British Navy, Army and Air Force in Southeast Asia into the Municipal Building where the signing of the surrender documents would take place in the Municipal Council Chamber. Representatives of the Malayan communities, including the Sultan of Johore and the Bishop of Singapore, were in audience. The Japanese delegates were the last to enter the chamber. They were led by General Itagaki, who was representing Field Marshal Terauchi (who was ill after suffering a stroke). There was a request for everyone to “remain seated” before they entered. Proceedings of the Japanese official surrender ceremony. 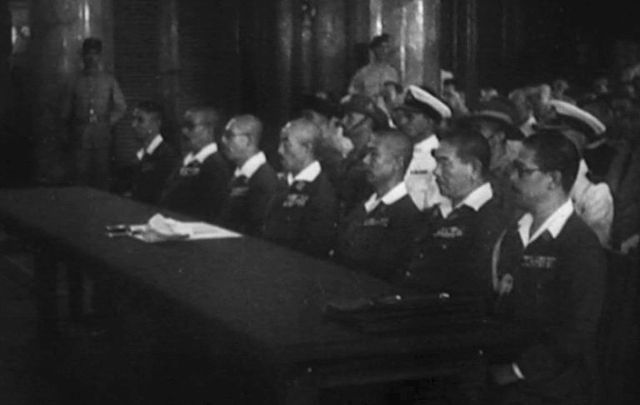 The British and Japanese military commanders were seated facing each other. Lord Mountbatten began by reading to everyone present his opening statement: “I have come here today to receive the formal surrender of all the Japanese forces within the Southeast Asia Command. (…) In addition to our Naval, Military and Air Forces which we have present in Singapore today, a large fleet is anchored off Port Swettenham and Port Dickson, and a large force started disembarking from them at daylight on 9 September. When I visited the force yesterday, there were 100,000 men ashore. This invasion would have taken place on 9 September whether the Japanese had resisted or not, and I wish to make it entirely clear to General Itagaki that he is surrendering to superior force here in Singapore.” Thereafter, Lord Mountbatten read aloud the contents of the Instrument of Surrender and both he and General Itagaki signed on all 11 copies of the surrender documents. The proceedings that took no longer than 10 minutes was complete. Film-still from the documentary “The History of Singapore”(2006). Film-stills from the documentary “The History of Singapore”(2006). After the signing of the Instrument of Surrender was completed, the Japanese delegates took their leave from the Municipal Building. Thus concluded 1,304 days of Japanese Occupation that had begun on 15 February 1942 when General Percival surrendered to the Japanese. After the Japanese departed, Lord Mountbatten headed towards the microphone at the head of the steps in front of the Municipal Building where he addressed the crowd and recounted the history of the Union Jack flag that was to be raised — it was the only Union Jack flag that had been kept by the internees in Singapore throughout the Japanese Occupation. 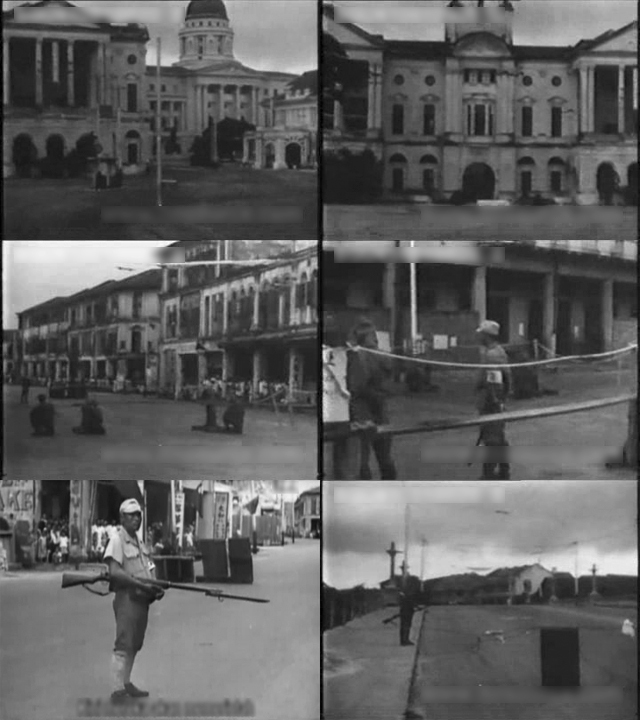 Film-stills from documentaries “The History of Singapore”(2006) and “Singapore 1942: End of Empire”(2012). The band played the National Anthem of the United Kingdom as the Union Jack flag was hoisted. This was followed by the national anthems of the United States, China, Holland and France. Dakota airplanes flew past in salute and the pompous ceremony staged to regain British pride was finally completed. The “wayang party”, to use a contemporary colloquial expression, was over. The end of Syonan-to. The end of Japanese dominance in Southeast Asia. The beginning of the end of the British empire in Asia. They had returned to a different state of affairs. Most of the “Asiatics” — to use a term that British colonialists have a habit of using in a derogatory manner — wanted them out and would demand for independence in the years to come. This is Part 1 – The Surrender. Part 2 – The Parades. Part 3 – The Decoration Ceremony.